I feel your pain. There is one that's not too far from me that tried to tell me that they could fit any bike to me (I'm 5'3) and I was looking at $3K road bikes. I just looked at the owner and thought seriously, would you tell a 6 foot male that too? Glad you found a better bike store. I'm good with that if that means I get what I want. Bingo. I know a lot about construction, but I can guarantee you that if my hubby was beside me I am ignored and they focus on him. The entrenched mind of the male specie, who claims he can learn and evolve, is very stubborn on this issue----men just cannot help acting like condescending jacka##es when it comes to women. Responses at the beginning of this thread illustrate this. The tendency of the male mind to look past the condescension a woman obviously felt (as you did in that place of business), thereby trying to marginalize it, and even attempting to explain it away with rational thought, well, that is classic simian recursive male idiocy. Having owned businesses over the decades, I've seen this firsthand, in fact have been guilty of it early on. But if you hire enough women, you learn, and learn fast. il Sogno, if that shop owner was that much of an brick where he couldn't read and/or realize how he was making you feel as he spoke to you----which would be obvious to any person who didn't have an ape brain still in their head------then just walk out and never go back there. Hang in there, you'll find a good shop. Sounds similar to every trip I've made to a LBS and spoke to someone who worked there. Stopped going a long time ago. Sometimes you eat the bar, and sometimes, well, he eats you. When you see that stuff, walking out is the best thing to do. Give your business to shops that treat you with respect. I would suggest at your price point, and with your experience, going frame + parts might give you a great result. Just something to think about, especially for a small frame. As for people who think sexism has nothing to do with this, I suggest you listen when women talk about their experiences. It is not always what is done, but how. Tone of voice, interruptions, etc. can all shape the meaning of what is going on. For example, men tend to interrupt women at the same rate as adults interrupt children, men tend to slow down when talking to women, as adults do with children. Think about that for a minute, if you are a guy and people started treating you like a child. Would you notice? Would it bother you? Now imagine it happened every day of your life. Think you would know it when you see it? For shop examples, trying to upsell while talking down to a woman is common, she does not KNOW, so the man has to EXPLAIN. For men, they are upsold differently, in that competence is assumed even if unwarranted. This is often done by throwing tech terms around and NOT explaining them, an implicit assumption of competence. I will close with this: questioning the OP's judgment about what she experienced, that maybe being a woman had NOTHING to do with what she experienced directly and YOU DID NOT EVEN WITNESS, is questing her competence. Me? I figure anyone who has been around a while, and is an experienced rider with a lot of experience in bike shops over the years, can figure out when she is being treated in a biased way. And il sogno, well, she seems a reliable witness to me, from my years of reading her posts. So I'll just go with "She knows what she experienced" and leave it at that. To flesh out the story about shop people schmoozing my husband, one of those shops is actually owned by a woman. You read it right, a woman. In that instance, we were at that shop because they have a bunch of nice bikes and They are about 14 miles from our house. I wanted to check out the Time frames. The salesman kept steering me towards the heavier lower end Time frame. I wanted the nice light one. The woman shop owner was there but she was schmoozing with a guy ringing up the gels he was buying. I wound up buying my Colnago C59 with Campy Record 11 at a shop that I go to semi regularly (because it's about 20 miles from our house). When we walked in, the shop owner recognized me and greeted me. I told him I wanted to buy a bike. He let me test ride his personal bikes (a BMC and a Time) as well as a Colnago in the shop. I told him I wanted the C59 with Campy Record. He told me that if I had some flexibility in my budget, he would cut me a deal on Super Record 11. He worked the numbers and offered me the Super Record 11 grouppo for about $110 more. First, I want your Colnago! What a beauty. Second, I am in no way doubting your original impression of your unsatisfactory interaction with the bike shop in the original post. I'm a husband and father of very strong women who have schooled me on some things that they experience that go completely under my radar. I know that I just don't get it, and I've learned to implicitly trust their judgements on that stuff. And not to minimize your experience at all, I would say that most of the bike shops I deal with, especially the chain-ish ones (Trek shops and Specialized shops for example) are often staffed with marginally expert sales people and, yes, even owners. They may or may not know as much as me, but always try to bulls... me with urban legends, and marketing crap. That doesn't have anything to do with their sexist idiocy, but they also exhibit non-sexist idiocy. I'm glad you got the right bike and it looks like you have good taste! OMG, that's my bike, well the bike I've been eyeing at my LBS for a year. It's been sold so I missed out, but it was so sweet I would drool over it every time it went in. Dayum, that is a nice looking bike! I'm sorry you had to go through such ridiculousness, but I'm glad to see it worked out. Enjoy that new ride. Find a few poseurs on the road. Give 'em an LA "look", then drop them like third-period French. You'll feel better about the sexist pigs out there. In 2012, I decided I needed a new road bike. There is only one shop in my small town, so I drove to Savannah, GA, which has several. Went to a shop that I'd been to before that seemed knowledgable. They sold Pinarello, Orbea, and Specialized. I talked to someone I hadn't spoken with before, who turned out to be the owner. Explained that my current bike was carbon with 105 drivetrain, and Ultegra shifters. Said wasn't sure what I wanted, but it needed to be at least as good as that, preferably better. Budget depended on the bike. (Read, flexible, around 4 grand. Right?). He instructed one of his guys to get the Pinarello Quattro from the window display. 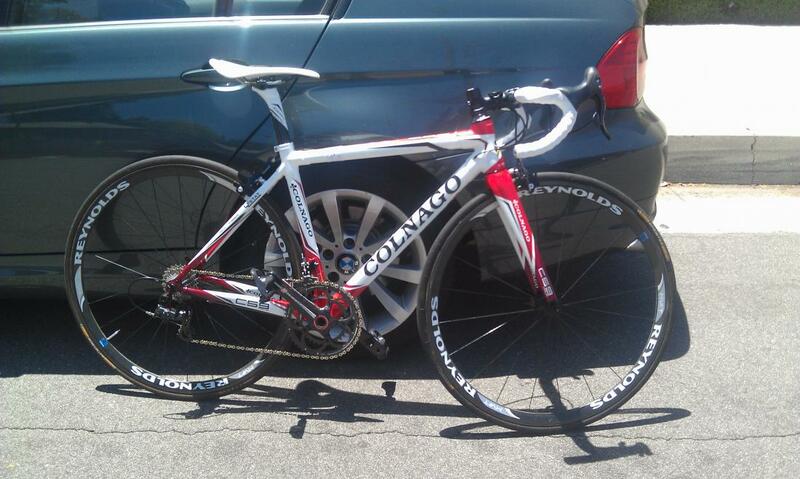 (It was actually a Pinarello Due, which was a step down in all areas of the bike, frame set, wheels, drivetrain). I assume he misspoke. I tested it, it seemed like a nice bike, but it reminded my of my current ride, a Cannondale Synapse. I wanted something different. Really, he had the bars up too much, and the saddle too low. But I loved the way the bike cornered. I tested several other bikes, too. He said to go home and check out the Pina online and read about it, etc. (duh, but at least he wasn't rushing me). Came back a week later after reading up on the Pina. Was still a little hesitant. Another woman was just bringing the bike back from her test ride on that same bike, btw, and I went for another ride. (I'm 5'7", she was 5'6"). The bike was a men's 50, with a TT of about 525. The shop owner informed me that he had just sold the bike to the other woman (other woman, hah! ), but she'd put it on layaway, so I could try it again. This time, he tried several different configurations, and finally put the bars quite low, and the saddle quite high (the right height for someone with a 33.3 inch pbm). He was shocked. It was very unusual for a woman to need saddle to bar drop. The difference made the bike feel completely different. I decided I wanted one. But I was a little confused. The price was lower than the Quattros I'd seen online, and it didn't look quite right. He told me not to worry, that I could buy handmade wheels to go with the bike. The ones he had on his Orbea were $1100.00 handmade wheels suitable for up to a 200 lb rider. (I'm 150 lbs). I told him 'no.' Unequivocally. He spent some more time trying to talk me into it. I said no, again. He said I could get them next year. Again. No. Again--he didn't listen. Then he said I needed to buy carbon bars for the bike. I told him no. He said I needed him. On and on. I began to be afraid the guy was going to nickel and dime me on parts, and I'd have to be very careful. He said he'd call me as soon as he got a price from Gita (US Pinarello distributer). This was July, and the Pinas were on sale (I knew this from being online, he didn't tell me that). Several days later, he called, and said: guess what?! I got the Due Ultegra for $2750.00!!! "What? I thought it was the Quattro??" We went back and forth, and I told him the Quattro appeared much better, and I wanted that one. He said he had a Quattro in stock, and maybe he could make that one work for me (it was a size 46.5 'easy fit' with a high head tube, the one I tested was size 50 unisex with lower HT). He got annoyed. Said he'd get back to me, and hung up. I called back FIVE times, trying to order a Quattro in size 50 and left messages with his associates. He never returned my call. I started trying to find a new bike shop. Easier said than done. The closest Pinarello shop was over 3 hours away, in Columbia SC. (I hate Columbia. Yuck). I located one in Greenville SC, 5 hours from my home. (Actually, found one in Charlotte NC first, but that fell through when they lost their Pina contract, so, another several weeks wasted). The shop in Greenville advised me to come in for a sizing before ordering the bike. I agreed, so made a special trip up there to get sized, and they put me on a 51.5 vice the 50. So now a TT of 535 and 130 ht. Much better. My Cannondale Synapse had a 530 TT with 130 mm ht, and the Pina Due had been around 525 (may have been 528, can't remember), and no idea what the HT was. Made the second trip and got my bike. I could have stayed in a hotel several days and waited for the bike to come in, since Gita was only a few hours away, but 2 trips were better. Was this a sexist issue? Yeah, it was. Why? Guy's tone was so condescending, and when I asked questions, he acted like there was no way I could understand (I wanted to know what the differences in carbon cloth were, he said it was complicated...blah blah. He did that with a lot of things. Jeeze. ). Anyway. Long and drawn out. I believe if it hadn't been that guy, one of his sales associates would have managed to sell me the bike. Not sure why he was okay with ordering a lower quality bike, but not the Quattro. But, anyway! I got the right bike, and it actually fits. I wasn't positive, back then what was off about my cannondale, so could never tell if it needed to be slightly larger or smaller. (I'm weird to fit cause I use a zero-offset seat post, and it took years to figure that out, definitely changes bike fit). Okaaaay. Didn't mean to write an essay!! Last edited by aureliajulia; 05-31-2015 at 06:22 AM. He probably didn't know what the differences were in the carbon cloth, either, but his pride wouldn't let him admit it. I would get a price for both ways. My shop will swap them out but the extra to keep the originals is usually so low it's a no brainer. What model were you looking at? Maybe there were other differences ? Sometimes salespeople make up their mind that one option is much better but don't listen to customers. He was trying to sell me the $5000 Stumpjumper. t is clear to me that because I was a woman shopping for a bike on my own, the shop owner thought he could convince me to buy a bike way above my budget and then get me to buy two sets of wheels along with that bike. Ok here is my thought, as said I don't think the owner was sexist at all. My local LBS that I have spent over $30k with over the last 3 years wouldn't swap wheels out for me either, and I spend a lot of money and tend to have some pull with the store mgr and owner. They still wont do that for the reasons stated before. They have no way to give you a fair trade value for the stock wheels and then they are the ones stuck trying to sell the stock wheels which probably are not a high demand wheel set. My thoughts and this is coming from someone who Started on Trek bikes, went to a Spec Epic FS and now rides a Giant Anthem Advanced 27.5-1 with the factory Giant carbon wheels ($8k setup) is to skip Specialized all together. Giant XTC Advanced 27.5-1 - Carbon frame, carbon wheels, XT drivetrain. Retail is $4125, you should be able to get at least 10% off. Giant XTC Advanced SL 27.5-1 - Carbon frame (lighter and stiffer than the XTC Advanced), carbon wheels, SRAM 1x11 XO drivetrain, Rockshox SID RL fork - $5150, once again you could prob get 10% knocked off. Both of those bikes are excellent options and meet all of your preference points. I am picking up the XTC Advanced SL 27.5-1 after the new year to complement my AA1 that I am on now. Best of both worlds, FS for the rough stuff and HT for the faster more flowing tracks. I liked the Giant Anthem. I never got to ride a Specialized X country bike. I did get to ride some Niners. If I were to buy a mountain bike today, it would be the Niner Jet 9 RDO. I'll bet you have some good stories to tell about the times you took your car in for repairs. Without your husband. I have had numerous experiences at different mechanics when I go without my husband. One guy told my Honda Element was due for a "major" service when I had scheduled a "minor" service. Nothing I said would convince him otherwise. The price difference was huge. I finally had to retrieve the Element's manual and show him what exactly was due at that mileage. They don't pull this crap when my husband takes his car in. Don't tell me I'm not supposed to be here, because this is where I am. Topanga Creek carries Niners and Pivots. Chris has always done right by me. Do you mind letting other SoCalers know which shop was trying to upset you on the Spesh?